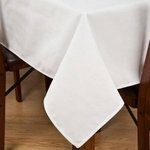 Buy your wholesale tablecloths in bulk by the case to cover your table linen needs. 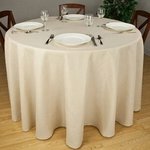 Rounds, Squares, and Banquet style tablecloths are available with Free Shipping on every order. 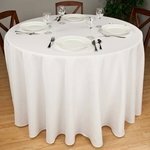 A leader in many dining rooms, banquet halls and conference centers, the Riegel Premier Spun Polyester Tablecloths delight guest, diners, and housekeeping alike. 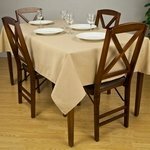 The 7.2 oz fabric weight provides excellent cover for tables, a soft hand for guest, and long-lasting durability for commercial laundering. 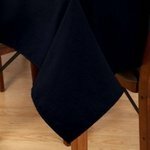 Diners and guest love these elegant, yet durable wholesale tablecloths with their cotton-like softness, premium absorption, and top quality construction. 7.2 oz/sq yard - Heavy weight, cotton-blend-type texture. Captures the look and feel of cotton with softness and shine. 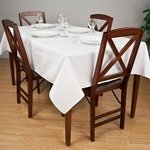 Spun polyester does not fade and has the high absorption that diners demand, eliminating the negative aspect of 100% polyester table linens. Spun polyester is tested to last over 200 washes. Excellent color retention, absorption with Superior Stain Release. No picking, snagging, or linting. Sign up to receive new product alerts and specials! Copyright 2008-2019 Palmetto Linen Distributors, Inc. All rights reserved.